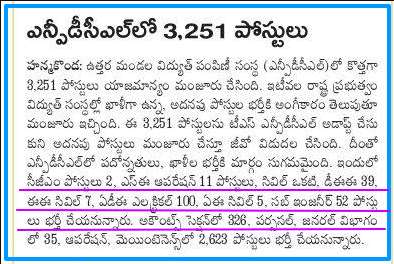 Telangana Northern Power Distribution Company Limited has issued a TSNPDCL 2018-2019 Recruitment Notification to fill 13357 Assistant Engineer Vacancies in various electricity departments. 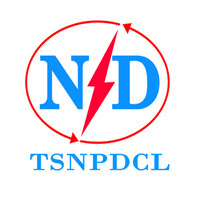 Aspirants who wish to apply for TS NPDCL AE Jobs can check the eligibility criteria. Eligible candidates can go through online mode to apply for Latest TSNPDCL Govt Jobs 2018-19. Also, check the TSNPDCL Notification 2018 details such as eligibility, apply online, fee, exam dates, the name of posts, etc. Candidates have to submit the application form as soon as possible to avoid the server issues. Latest Update: TS SPDCL Notification 2018 Released. Interested candidates may submit their application forms before the last date i.e 19th February 2018. Are you looking for Govt Jobs in Telangana? This is a very good news for the candidates for you. TSNPDCL has announced the Telangana Power Distribution Company Recruitment Notification 2018. Recently, the Northern Power Distribution Company Limited of Telangana has released the TSNPDCL Asst Engineer Recruitment Notification 2018. First of all, candidates have to check the eligibility conditions and then apply for 13357 TSNPDCL Jobs through online. Candidates who have completed bachelor’s degree will reach the minimum eligibility conditions for TS npdcl Assistant Engineer Vacancies. The Telangana Electricity Department Notification 2018 details such as application form, fee, eligibility, age limit, vacancies, posts names, etc are provided in this article. We advise the candidates not to miss a single word on this page to get the complete information regarding TSNPDCL Notification 2018. The Chief minister of Telangana, KCR has given the permission for the appointment of 13357 employees in various electrical departments. CM has instructed the concerned officials to fill the vacancies which are vacant from 2012. Within the short span of time, the officials will release the notifications for TSGENCO, TSTRANSCO, TSSPDCL, TSNPDCL. Through these notifications, the officials are going to fill 13357 vacancies under TS Genco, TS Transco, TS SPDCL, TS Npdcl from Junior lineman to Executive Officer. Also, the officials will release a notification to fill 1500 non-technical posts. Candidates who are willing to apply for TS NDPCL Jobs have to satisfy the eligibility conditions provided below before going to fill the application form. The educational qualification for TS NPDCL AE Vacancies is as follows. Candidates have to possess B.E/B.Tech/A.I.M.E in Electrical & electronics engineering or equivalent from a recognized university. Aspirants should have completed B.E/B.Tech/A.I.M.E in Civil engineering from a recognized university to apply for TSNPDCL Recruitment 2018. Candidates who are willing to apply for TS NPDCL Posts have to possess the age within the above limits. Applicants of NPDCL Exam 2018 are shortlisted on the basis of merit list in the written exam. Applicants are facing difficulty in applying for the TS NPDCL Assistant Engineer Vacancies through the official website. So, our unit has attached here the simple steps to fill & submit the application form through online mode. All the aspirants can follow these guidelines provided here while filling the TSNPDCL Online Application 2018. How to fill TSNPDCL Application Form 2018? On the homepage, search for TSNPDCL Notification 2018 details. Read the notification details carefully before filling the ts npdcl online application 2018. Click on “TSNPDCL Apply Online” link. Fill all the details in TSNPDCL Online Application form. Upload the scanned images such as photo & signature. Carefully check all the details in the tsnpdcl online form before submitting it. Finally, submit the TSNPDCL Application Form 2018. The information provided on this page regarding TSNPDCL Notification 2018 is for the reference purpose only. We advise the aspirants to stay connected to this page for more details of Telangana NPDCL AE Jobs. This is only the Paper Notification. Till Now the Officials haven’t released any official announcement regarding the Telangana NPDCL. So, Stay tuned with us. Once the Official notification released soon we update the dates and Vacancy details. What are the chances for b.com(comp)? And what is the age limit? what will be the expected qualification required for the posts of Junior Accounting Officer? When can we expect Executive Officer and 1500 non-technical posts related notification Dates. We want detailed information. When will declare the notification of transco gen co tsnpdcl in accounts department? is there any jobs available with diploma qualification. Is Last semister diploma students are eligible for this ts npdcl sub engineer recruitment??? What are chances for bcom students…. when will be tsnpdcl jao notification? when will be tsnpdcl jao notification….. In this year any npdcl notification (sub engg & AE) coming or not? when will expect npdcl jao nitification..? ?